Let’s take some time to backtrack, shall we? Last last time I mentioned that I wasn’t sure if we could graft onto the dragonfruit yet. Turns out we could! I sent Eli out the next day (before Romance Time happened) when she was rested to take care of it. As of right now we’re still waiting for that cowplant berry! Next: Lucie has been sadly neglected… or so you think. While he sister was romancing Shaurya, Lucie had a gentleman caller. Ignore Damien behind him, lol. Lucie doesn’t know what’s about to happen to her. His name is Aubrey and he’s a friend of Shaurya. He visits A LOT. The first time (up above) I had Lucie answer. Every time thereafter she would answer and chat him up. He’s got such an interesting profile that I wonder what their children would look like… Lucie probably wonders that, too. What a doofus. I can’t believe he’s a townie! He’s so unique looking! I’m glad Lucie likes him, too! The next night he called and asked her out!!! She declined because we didn’t have time to follow her around with Rosie’s impending birth. Sorry, Lucie! Rest assured that you’re next to get married and kicked out. Aaaand that’s what I did. Bun in oven, proposal, marriage, and moved out. Done! We’ll visit you when the kids are older. Not a lot to report for him, unfortunately. He’s easily moving up in his job! However, his love life is slow going. He’s struggling but I think I’ll be able to help him the next time I play. I finally got to see the MCCC adoption service working and it’s NEAT! Poor Tiffany, though. She had to move around twice because Malcom was already an elder when her mother died and he died shortly after. Promotions! The whole house has been getting promotions but Lucie and Andrew aren’t our focus here. We’re all about those heirs. Two promotions for Rosie and another for Eli. Nice work, ladies! Damien even called in his congratulations (late of course)! SPEAKING OF DAMIEN, here’s a very small pic of his and Angel’s son, Tyree! SO! Between Rosie getting pregnant and Lucie romancing Aubrey, Eli got her first notice of impending doom. She had some unfinished business in the garden so I worked on her aspiration points since she was short. All the while I waited and watched her bar to make sure I got the most time for my buck. I queued up her potion of youth. She didn’t seem to like the idea of prolonging her life. I made her do it anyway. Then bam! Only one step away from cowplant and a completed aspiration. We might have gotten there sooner if I hadn’t FORGOTTEN about the cowplant recipe. Doi. She was tired after working in that garden but I wanted her to have a good day. I had Lucie and Andrew give her some Zzz Juice and hygiene potion so she could drink her way to happiness. I agree Aubrey doesn’t look at all like a random townie! I can’t wait to see how their kids turn out. Oh and on the cowberries… check the household inventory. I have no idea why but they keep showing up there for me. I think there’s like 18 in there right now. So odd. Mariko looks almost identical to a repair girl that married one of my Drifter spares! I’ll have to find a pic for you. I think I’m going to turn death notifications on because I like how you have it so you know who’s kid is being adopted out. And lastly in this novel of a comment: I knew it! I knew Elise would take a youth potion! Maybe Aubrey isn’t a townie? I’ll double check that but seriously, that nose! If he’s a townie I’ll have to save him to my bin. He’s so unique! AH I will check the inventory!! AND I’m totally gonna plant them to get more $$ thanks to your trick! 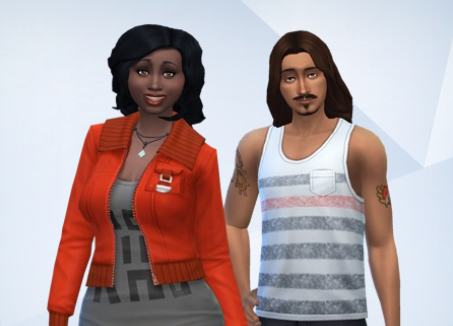 Mariko has that townie look to her, lol. Ha! I wasn’t going to miss out on keeping her around! That gardening aspiration always takes me longer even on normal, lol. You should totally save Aubrey. I wouldn’t mind adding him in somewhere. I didn’t learn all his traits so watch him be evil or something, LOL. He was also unemployed! OH OH OH! He is Maaike Haas’s son!!!! He’s under the same hashtag that you used for Moose! I totally see both now, lololol! What ? Aubrey is Paolo and Maaike ‘s son? Now I get it ! That explains his appearance ! As soon as I saw his last name I IMMEDIATELY recognized Maaike’s face!! I can see Paolo in him, too! Is it very subtle? I think I can see him! Aubrey is really neat ! I know! And he just fell into our lap!!! I loved this! It was great to get updates on everyone! Nooboo, marriage and the boot! Hahaha!